French ultrarunner Julien Chorier describes the ordeal of the 2011 Hardrock 100 for a video crew from South Africa on Saturday in Silverton. Chorier, who lives in the French Alps, won the 100-mile race in his first attempt. SILVERTON – Altitude, altitude, altitude. Ultrarunner Julien Chorier and his crew had altitude on their minds when he approached the 2011 Hardrock 100 Endurance Run. One hundred miles of tough trail running posed one big problem. But altitude posed an even greater challenge for the native of the France. “Julien lives in the Alps ... he’s run a lot of those (European) mountain trail races,” said Adam Chase of the Salomon Global Team that provided support for Chorier and a handful of team runners. “He’s used to steep up or steep down, so that wasn’t as much of an issue as the altitude,” said Chase, the Salomon brand manager for the United States and a former top mountain trail runner. Chase said the team only had two and a half weeks to prepare Chorier and his compatriots for the high-altitude test. But with just two and a half weeks of prep time, Chase said the team sent Chorier and the other runners to Breckenridge for three days of high altitude training and sleep (9,500 feet). “Then we came down here, and we actually had them stay at Cascade (Village) so they were sleeping a little lower (8,200 feet),” Chase said. “Then they would go up (higher) and do parts of the course during the day. “There was an emphasis on getting the proper rest,” he said. Chase said longtime running pal Aaron Denberg lives in Durango and helped the runners on the trails. Denberg finished 10th in the 2009 Hardrock 100. “He knows the course, and that really helped,” Chase said. All of the preparation paid off when Chorier trotted across the finish line to win the 2011 Hardrock 100 in 25 hours and 16 minutes Saturday morning. He planned to start fast. He did – faster than anyone in the history of the Hardrock. He covered the first half of the course quicker than any runner ever on the counterclockwise route from Silverton to Lake City to Ouray to Telluride and back to Silverton. “He had clearly studied this race ... section by section. He had his (time) splits, and he was always within seconds (after miles on the trail),” Chase said. “He knew where he would have a hard time, like going up Handies. He stuck right to his plan,” said, who adding that the French runner wanted a fast start with slower miles in the middle and a strong finish. His pace runner for the final mountain marathon section was Rickey Gates of Aspen, a top trail runner and a former prep state cross country champion. 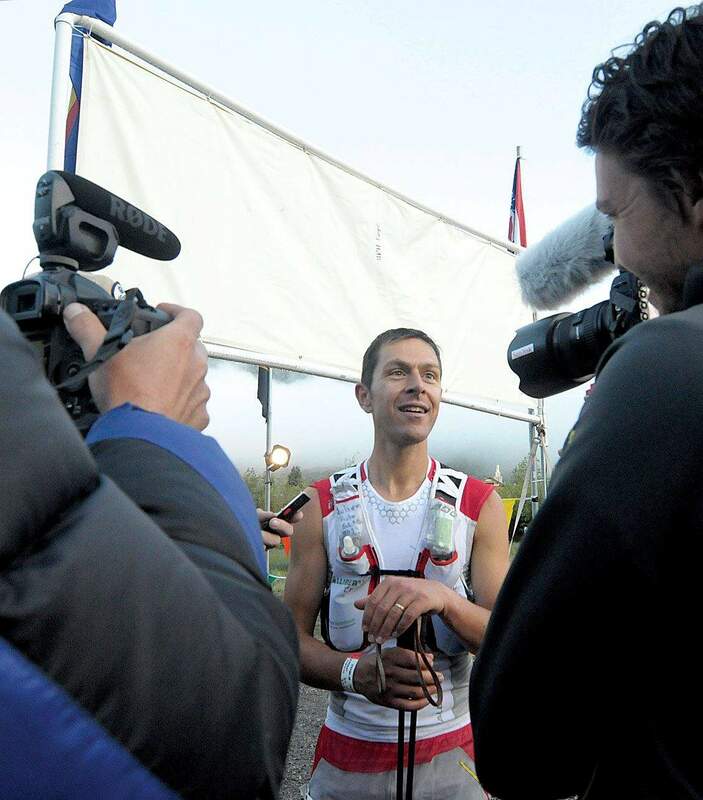 When Chorier won, it marked only the second time a foreign runner has won the Hardrock 100. Englishmen Mark Hartell and Mark McDermott crossed the finish line together to share the title about 12 years ago. Durango’s Dakota Jones, 20, was second to Chorier this year with Nick Clark of Fort Collins third. Frenchman Daniel Levy, who prepped with Chorier, was fourth. Diana Finkel of South Fork won the women’s division for the fourth consecutive year. She was fifth overall. Another Salomon team runner, Nerea Martinez Urruzola of Spain, challenged Finkel and women’s runner-up Darcy Africa of Boulder through the early miles. “Maria was a strong third when she got very lost and had to drop out,” Chase said. “She’s a good runner. She’s like a Diana Finkel in that she gets stronger and stronger as the race goes on,” he said. She got lost where the course turned for the climb up Handies Peak. Instead, she ran all the way around the base of Handies. “Getting lost can be part of the experience,” Chase said. Chorier, too, got lost but just briefly. “There’s something about where he’s from ... about the French Alps,” Chase said.